Love her or loath her, Barbie, the iconic plastic doll that has cluttered the toy boxes of many little girls around the globe for 56 years (crazy right?) has added yet another career to her resume. And we’re giving Barbie’s makers, Mattel, a round of applause. Why? Because Barbie is finally beginning to look a little more like us. Sure, she is still overly skinny with incredibly large eyes and a thigh gap no young girl should aspire to have, but she has finally tossed her stilettos in the bin and donned comfortable, modern foot attire. It’s taken 56 years for Mattel to alter Barbie’s choice in foot apparel but it has finally happened. Yes, Barbie’s rockin’ some flats. Meet Film Director Barbie. She is the latest leading lady for little girls to admire. Film Director Barbie carries a script and accessorises with oversized sunnies and a utility belt. She wears skinny jeans, a fitted pink sweater, a funky scarf and Mary Jane flats. I won’t lie. I want what she’s wearing. Film Director Barbie is one of the first in a collection of Barbies with articulated ankles and Barbie’s newly-human joints allow her to wear both heels and flats. Sure, it’s a small step for Barbie, but it’s a step in the right direction. 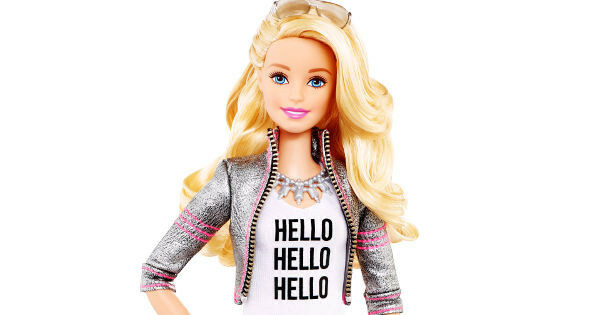 This isn’t the first time Mattel has attempted to ‘normalise’ Barbie. Last year Enterpreneur Barbie stepped out in a fancy business suit and the media was less than impressed. “It’s just the same, unattainable, physical, out of proportion body ideals put in a business suit with accessories and lipstick,” Sydney University body image expert Professor Jenny O’Dea said. Will Film Director Barbie suffer the same criticism? What’s next in the land of Barbie? There are reports that the company is gearing up to debut its “Fashionista” Barbies which will include dolls with eight different skin tones, 14 different facial shapes, 18 eyes colours, 22 hair styles and 23 hair colours. Babyology reported earlier this year that Hello Barbie, the first interactive talking Barbie, will be here later this year. And, unlike the controversial Teen Talk Barbie, launched in 1992, this Barbie will be able to say more than just, “Math class is tough!” In fact, she will tell jokes, play games, answer question and over time, adapt to her owner. Barbie has certainly come a long way since her 1959 debut. She’s been an astronaut, a race car driver, a human Light Brite and she’s even had a home birth (yes, we have the photos to prove it!). She has taken up residence from Vegas to Paris and has sported outfits from almost every country in the Commonwealth. Which is your favourite Barbie?